From spring through fall, an old dead tree near a highway has many cormorants in it. It’s been their hangout for generations. People drive by and think they’re seeing crows or maybe vultures. But they’re cormorants. On this winter day, you drive past that spot and notice the tree’s no longer there. 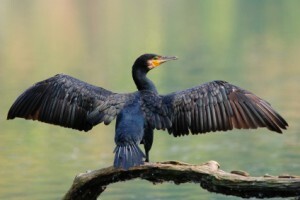 When things warm up and cormorants return, they’re going to look for it. You continue down the road, away from the blank space where the cormorants’ tree used to be. The gap back there reminds you of a missing tooth. When the cormorants come they’ll hover over it in confusion for a while. You feel a kind of philosophical shoulder-shrug sorrow for this inevitable truth. Their world is going to be shaken. They’ll manage, of course. But the fact that such things happen to birds and man is disconcerting, like the ominous appearance of a cormorant itself. If you’re around next spring, and if you drive past the tree that’s not there and you see that there are no cormorants, you’ll know that your life has been changed a little. Yeah, your life. Sure, it’s the cormorants that have been affected. But they were your cormorants. And that old dead tree was your old dead tree. A part of your world that got a tooth knocked out. You are currently browsing the Two-Fisted Bird Watcher blog archives for December, 2015.